We believe in giving back. We are all in this together, and it is important to us that all of us succeed. We, at Abraxas, cannot help the entire world, but we can help some organizations. Below are links to a few we are presently supporting. There are few better experiences than lying on your back, shaded by trees and lazily gazing into the sky. Boy Scouts taught me to feel at ease in nature. I learned the self-confidence that no matter what happened, I knew how to survive in the wilderness. Because of scouting, I am at home in the woods. I wish this blessing on all children. Scouting also taught me leadership in baby steps. The leadership training starts early. I began by teaching younger boys how to tie knots, lash, make tents from plastic sheets and rocks, and other things. Then I graduated to true leadership, where, as a patrol leader, I shepherded a patrol of younger boys. I organized their meals and transportation for our monthly camping trips, and assigned dishwashing, cooking and cleanup duties, and, of course, I made many mistakes. This was a big deal, now I think about it, for a child of 14. 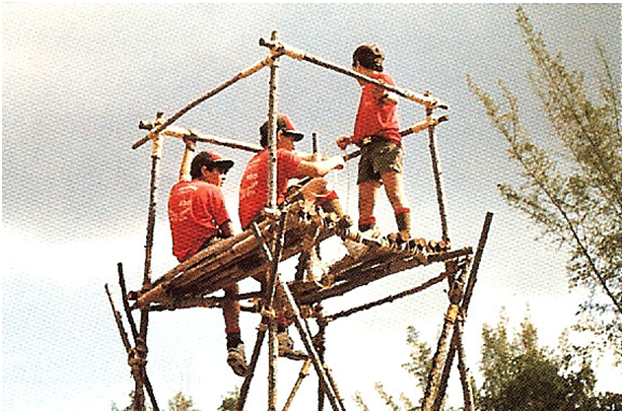 Scouts also fueled my ambition. As a young scout, I dreamed of earning all sorts of difficult and daunting merit badges (daunting for a young boy, that is), such as hiking (where you have to do several 20 mile hikes), pioneering (where you have to lash structures out of rope and branches), and citizenship in the nation (where you had to memorize the preamble to the US Constitution). If you wanted to be an Eagle Scout, you had to work hard, be ambitious, apply yourself—and rewards would come your way. You would advance. You would get the merit badges. And many of us did, developing a confidence that we can achieve our goals with hard work. I know it is in vogue to claim to love nature, and perhaps to love hiking. But how many would feel secure being lost with just a pocket knife, knowing that you can forage for food, and orienteer your way back to civilization? I don’t think many. More than ever, the lives of today’s youth are centered on technology, and they are losing touch with nature. Mouthing a reverence for nature is not the same as feeling absolutely comfortable in the woods, and knowing you can survive no matter what. I am sure this growing distance from nature is one contributor to the spiritual emptiness and sickness we see around us today. How can you be full of hate when all you can hear is the wind in the trees? 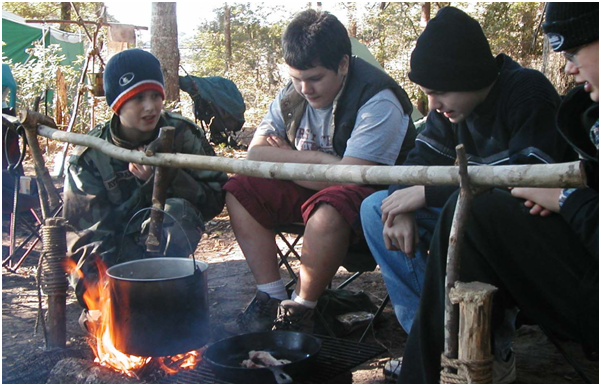 Scouting is an excellent teacher for young boys. It helps form them into confident, self-reliant leaders. For this reason Abraxas paid to send 10 scouts to summer camp this year. (Our local scouting organization, the Los Padres Council, owns the Rancho Alegre summer camp that they lease out for “outdoor school” for the public schools during the school year.) But sadly, they did not make it to camp. 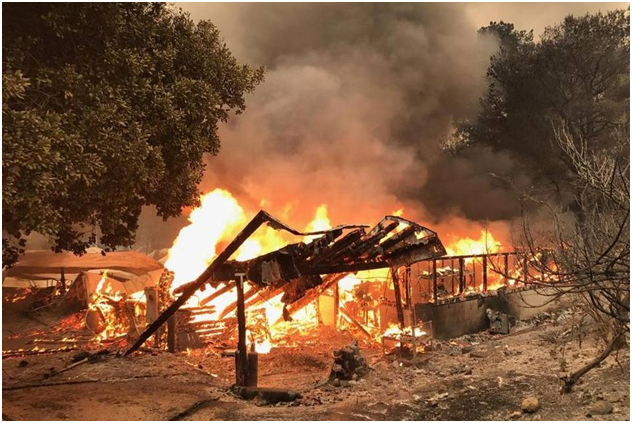 This July, the summer camp burnt down. So we donated another bundle of cash to help rebuild it. If you want to help our local Boy Scouts rebuild, please do so, knowing you are contributing to a future where the Earth is loved and respected.